Today, for the first time in a very long time, I baked bread. After a bit of mixing and waiting and then some more mixing and some more waiting and then some braiding and brushing and waiting and more brushing and even more waiting... ...a handsome golden brown challah emerged from the oven's ponderous depths. He is...delicious. I've been enjoying him slathered with marmalade. This may have to become my new springtime tradition. It is good to have traditions! My goodbye-winter-hello-spring ritual is making a lot of marmalade (here is this year's so far). Now I would like challah to go with it, though! March 29, 2011 at 8:17 p.m.
March 29, 2011 at 8:41 p.m.
looks yummy. Share the recipe? 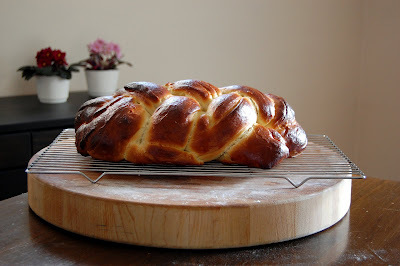 March 29, 2011 at 10:35 p.m.
March 29, 2011 at 10:42 p.m.
Ooooooooh, I love challah. Do you make it the old fashioned way, or do you mix it and let it rise in a bread machine? March 29, 2011 at 10:43 p.m.
March 30, 2011 at 4:30 a.m. Your challah looks delicious. I haven't made one in years but just finished up a chocolate chip challah from my favorite Kosher Bakery, Zaiddies. I'm looking for a mandle bread recipe like they make, marbelled with chocolate. March 30, 2011 at 9:20 a.m.
mmmmm! I've been trying my hand at artisan breads this winter...not nearly as successful. I love challah! Your loaf is beautiful - almost too lovely to cut into slices! March 30, 2011 at 9:37 a.m.
March 30, 2011 at 10:47 a.m.
Oh, that looks like a really yummy bread! And spring baking is a ritual around our house as it's a Mennonite tradition to bake Paska for Easter. It's a wonderful yeast-based citrus-y fluffy bread covered in icing and sprinkles. I can't wait!! March 30, 2011 at 12:11 p.m.
Can you skip socks for a while and make more bread? March 30, 2011 at 1:47 p.m.
Yum yum!! We were given challah after a seder at my cousins'. It was too much bread for us so I made french toast. Yummers! March 30, 2011 at 1:54 p.m. Thank you! The recipe is from The King Arthur Baking Companion. I'm not sure if I'm at liberty to just post it here. I can't, however, say enough about that book -- if you have even a passing interest in baking anything you need a copy in your reference library. I made this loaf (and the ensuing loaf, which since passed on,) by hand, with the help of my KitchenAid stand mixer. I let it do all the kneading for me. April 6, 2011 at 10:26 a.m.